I began work on this unit several months ago. I am a father of three beautiful, very active young girls, and a husband to a gorgeous wife who likes to do renovations, so my free time is not what it use to be. Like so many projects nearing completion, I am overwhelmed by the sheer number of things which could be improved or done differently. Indeed, if I were going to do it all over again, I would do things differently and I imagine I would save a great deal of time, money, and headache. But that’s why people who love to build things dive right in, yes we make mistakes, yes the quality may not be top notch (but this is something that improves the more you build) and yes it may be expensive but the alternative is to sit on the sidelines and not do anything, or do it so slowly that it never gets finished. 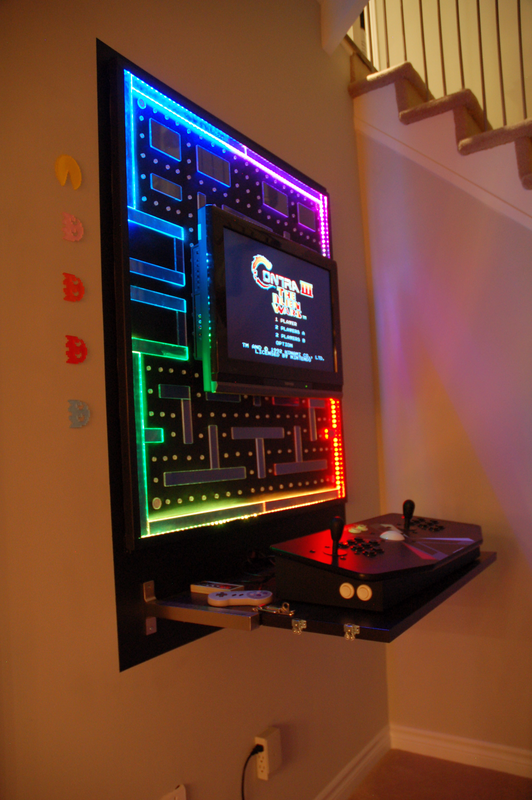 It consists of a themed wall panel, mounted flat screen high-definition television, an extended shelf, an X-Arcade Tank Stick, 257 individually addressable RGB LEDs on the inside edge of the panel, cup holders and a few decorations. The software driving the arcade is custom and consists of the primary server that controls the execution of the games, a mobile client application for selecting the games to play, and another server driving the decorative elements. The first steps in designing the physical exterior for the arcade involved selecting appropriate materials. This process can vary a lot between projects, but I usually start by determining the theme and any special features or effects I want to add. For example, I knew that I wanted to place LEDs on the inside edge of the frame, so I needed to choose a material that was thick enough and could be easily cut into pieces that were less than an inch wide. 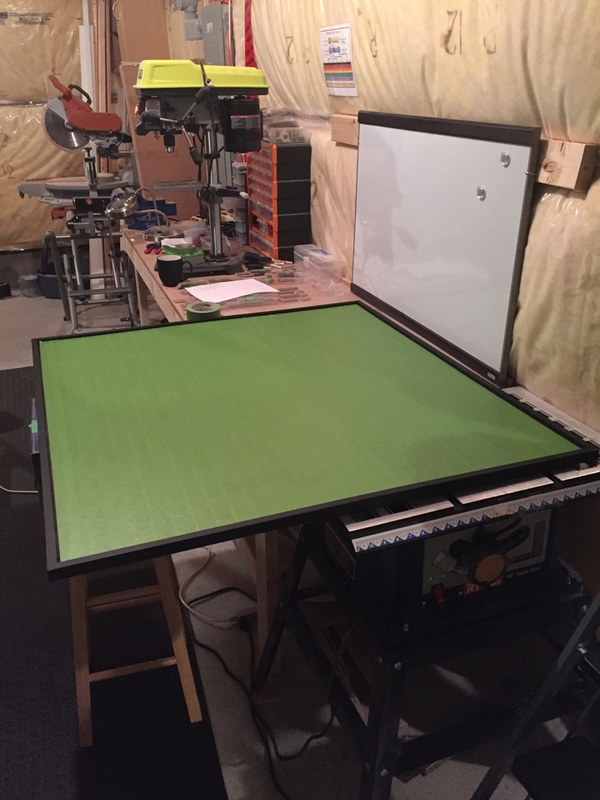 I also needed that material to be easily mountable to the outside edge of the frame. 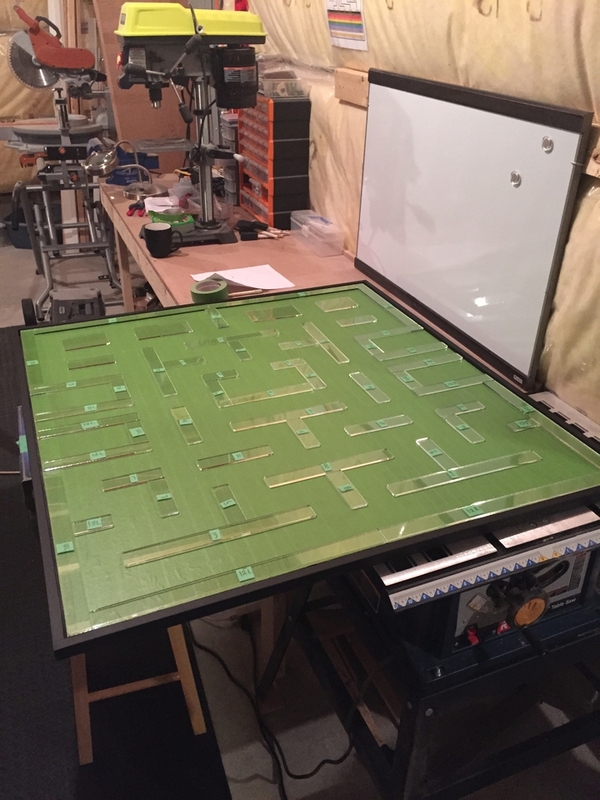 I wanted the light from the LEDs to diffuse through the pieces on the board, thus creating an illuminated display. I bought a few 24×12 pieces of clear acrylic. Before doing that, I had researched some acrylic material that was built for optimal diffusion, but it turned out to be too expensive, so I chose to stick with clear acrylic. The panel was assembled in a more complicated way than I would have liked. 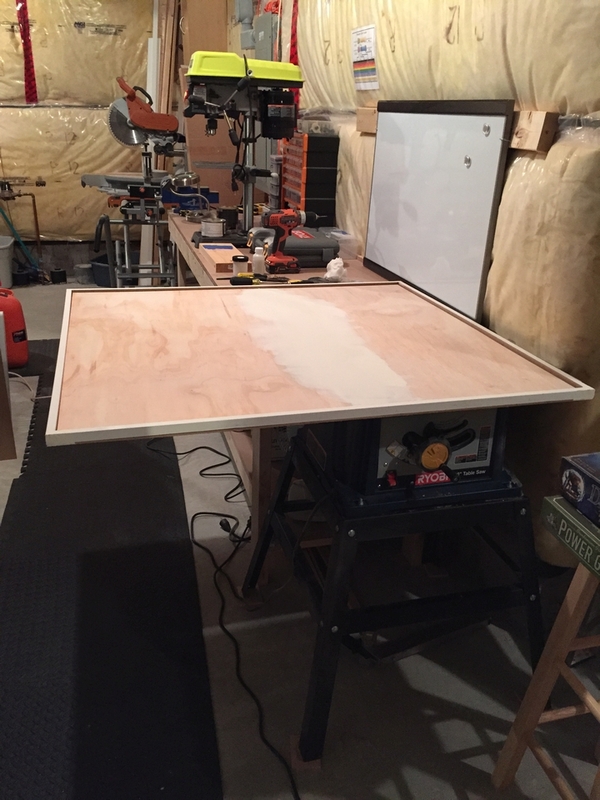 I was trying to reuse some plywood so instead of buying a piece of wood that was exactly the size I needed, I chose to assemble the pieces of plywood and glue them against a backing panel made of MDF. That worked, but it consumed considerably more time and there was fussiness around getting the edges lined up (due to the slight inaccuracies from various cutting tools). 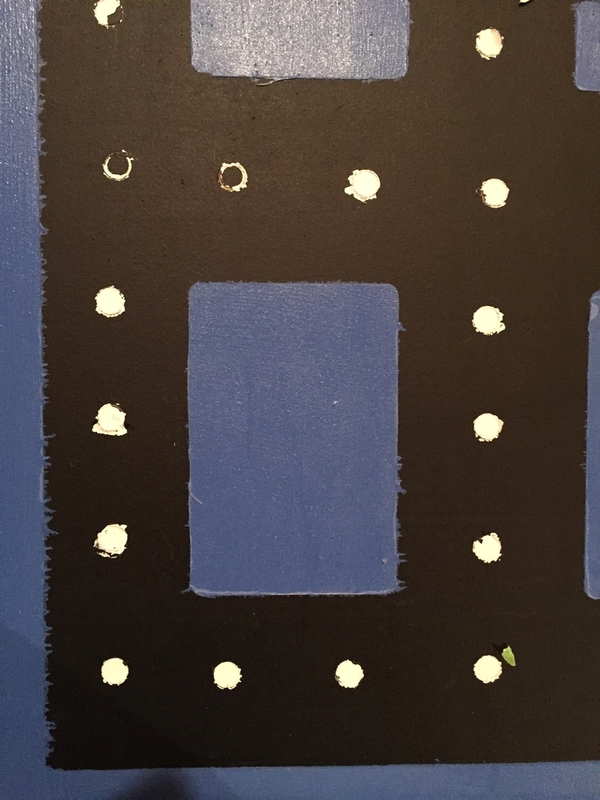 Anyway, after the pieces were glued, screwed, sanded, and trimmed, I painted the panel with a mat black undercoat. 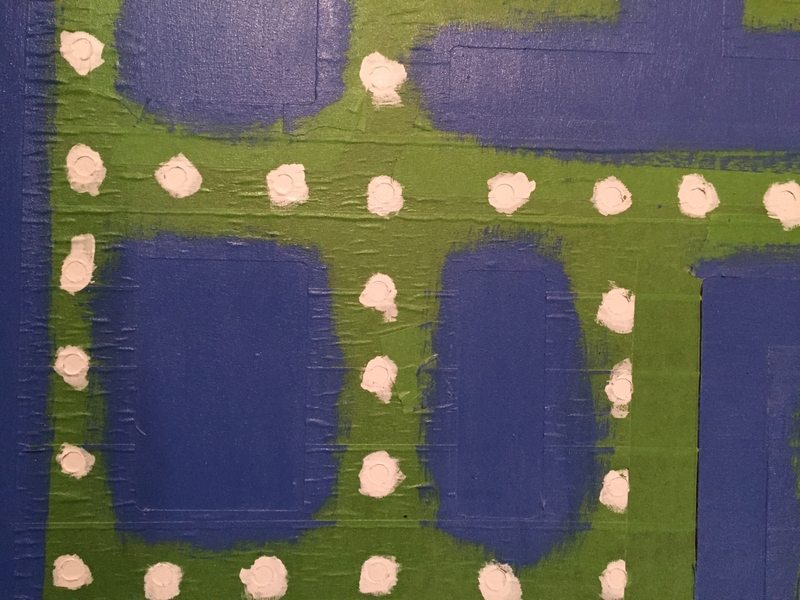 First using latex paint, then switching to oil based. I switched because the latex just wasn’t giving me the kind of mat finish I wanted. Whether or not the paint was acrylic or oil-based likely didn’t matter, it was probably the formulation for that brand that had the most impact on the finish. I happened to have oil based black on hand, so I used that rather than spending more money on a different brand of latex paint. 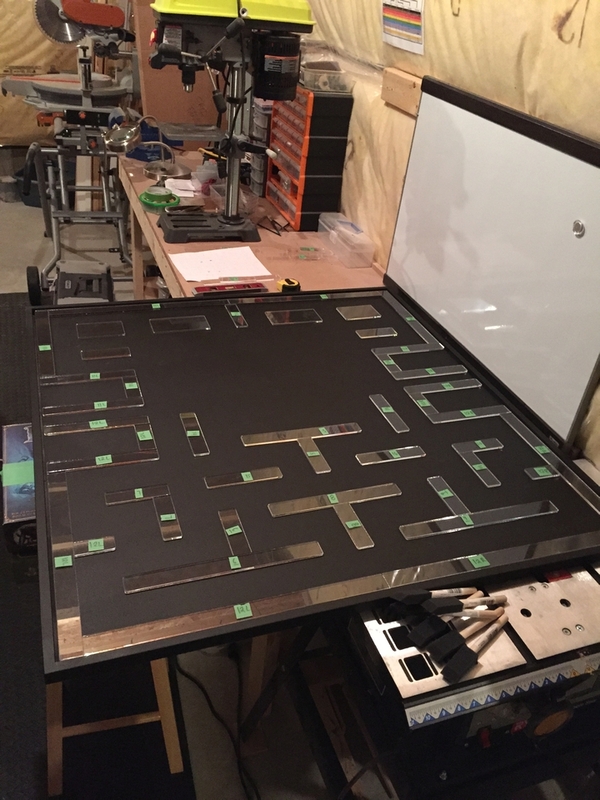 The board pieces needed to be designed before the acrylic material could be cut. I used Adobe Illustrator to design the pieces to be cut from 12×24 inch panels. The laser cutter available to me through the public library requires that the thickness of the lines in the design be less than 0.001 inches. When cutting acrylic be aware that the smell is quite unpleasant and should be ventilated. It takes about a day for most of it to dissipate from the cut pieces; I left it out in the garage overnight. 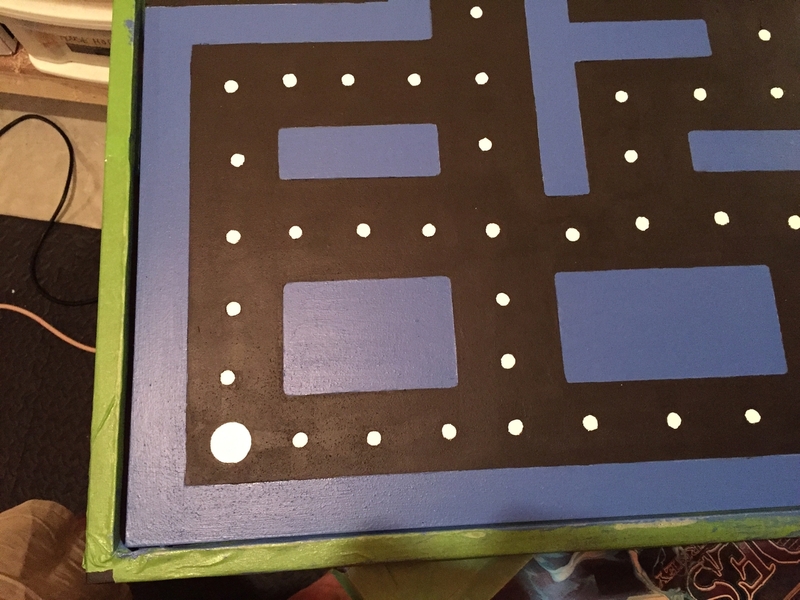 In order to transfer the Pac-Man like game board pattern to the painted base, I chose to tape the entire surface using painter’s tape. 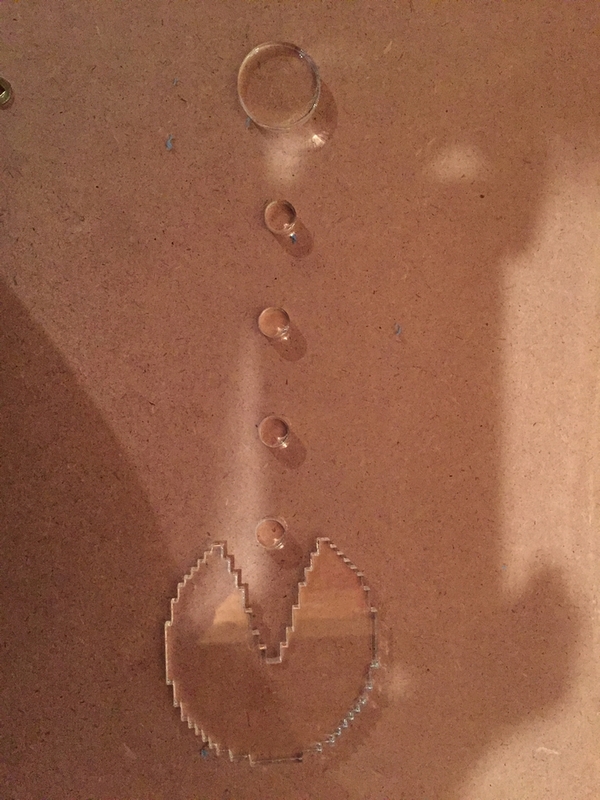 Following that, the acrylic pieces need to be laid out and traced, including all of the pellets from the pattern. Once traced, I cut them out with an X-Acto knife, and then created a special, circular drill bit to cut out the pellets. I chose to use those threaded wire funnels that come with light fixtures, but I needed to grind the bit for the edges to become sharp. Once the tape for the board pieces was cut out and removed, this exposed the flat black surface for paint. The painting process was tedious and not very interesting, so I am not going to belabor it anymore. This whole approach worked, but it was very time consuming and error prone as the paint needed to be touched up in many areas due to bleeding. I would recommend taking a different approach, if you were to do something similar. 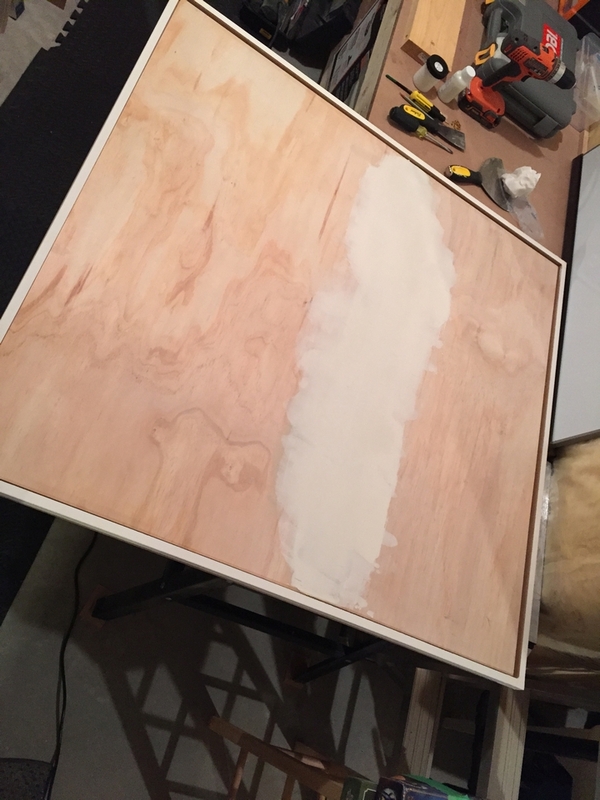 The gluing process was almost as tedious as the painting process since the glue could not be applied on top of the painted area as it would have been visible if it sat between the painted surface and the clear acrylic. It also wouldn’t have dried because the type of glue I used, Weldbond, requires exposure to air for curing. 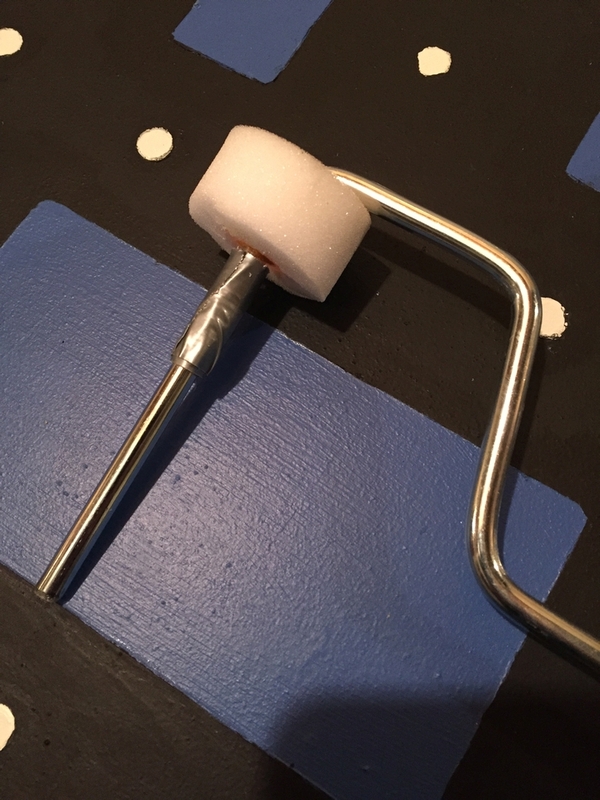 Instead, I applied the glue to the edges of the game board pieces (except for the pellets) using a needle. Ouch. The recommended approach above would have also made gluing the pieces to the board a lot easier as I could have used any kind of glue, rather than searching high and low for a specific kind of glue that was both strong and dried clear. 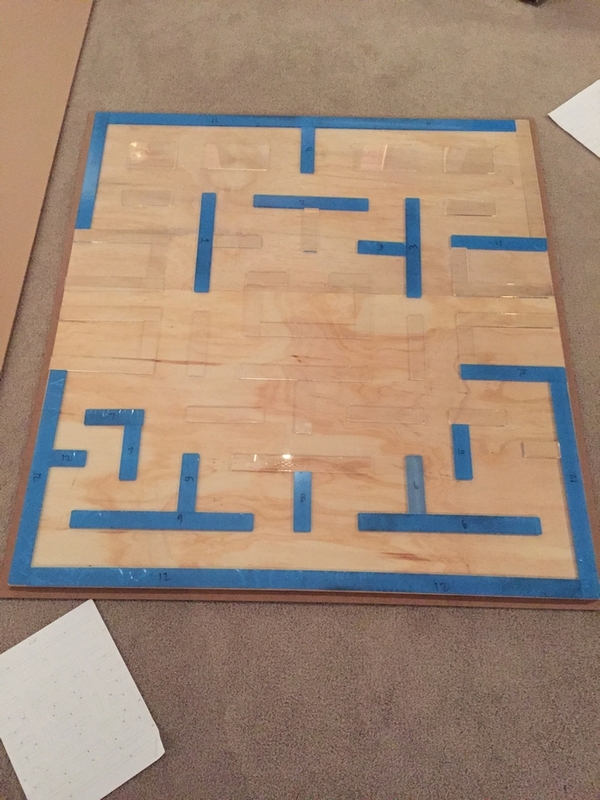 In retrospect, the result would have been faster and higher quality if I had thought to paint the underside of the board pieces in the desired color first before gluing them to the board. 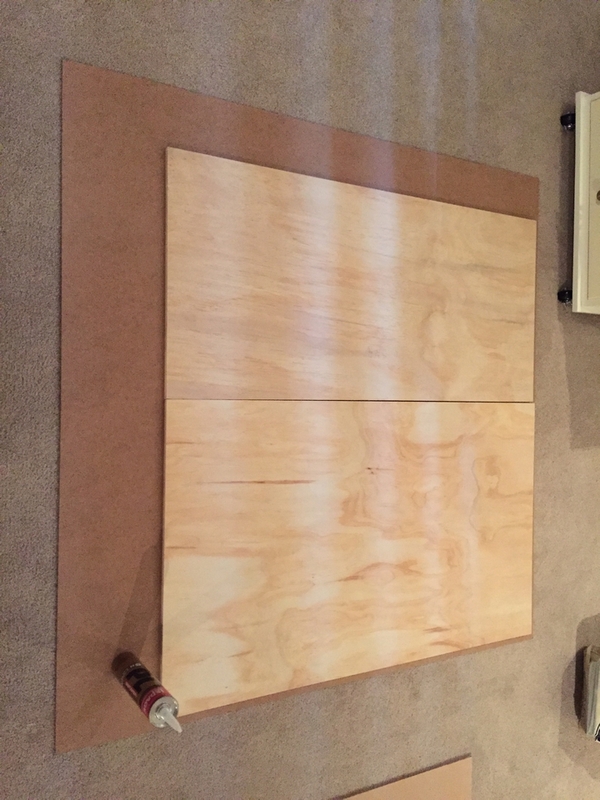 This would have made the painting and the glue selection process a lot easier and is the approach I would take if I were to build another one. I modded a couple of Ikea shelves to provide an extended platform so that my Tank Stick could sit comfortably, provide enough room for drinks and extra gamepads for other systems if necessary. It also provided some distance away from the screen so that players didn’t feel too close to it. I fastened them together using some latching hardware and strong clips so that the shelf could be folded if desired. The panel was mounted flush with the wall using four metal clasps screwed into each corner. I wanted the arcade to have more of a built-in feel, encompassing the joystick shelf and the panel, so I painted a region around the arcade giving it more of a framed in look. The television was mounted using a leveled bracket. I wanted it to be as close as possible to the panel and for the bracket to not be easily visible when standing next to the arcade on either side. I found a mounting system suitable for my needs and at a relatively cheap price at Ikea. When designing the panel in Adobe Illustrator, you must leave enough space for the bracket, otherwise you’ll be peeling off some acrylic pieces later and making some last minute cuts and holes. I included a few characters in the design such as Pac-man and the ghosts: Inky, Blinky, Pinky and Clyde. The were cut from acrylic and then painted on their opposite sides using some colorful latex paints. The Home Depot sells small “tester” paint samples which are far too small for a wall, but perfect for small projects like this one. I painted the undersides of the characters (by this point I had caught on to the better approach) and mounted them on the wall next to the arcade using some crazy glue in gel form. I also bought some black, textured plastic sheets from a plastics company called Canus Plastics. The sheets were about 1/8″ thick and could be cut with an X-Acto blade. After cutting them into strips, I used them as trim around the perimeter of the panel, which give it a more finished look and help to shield some of the light coming from the LED strips. 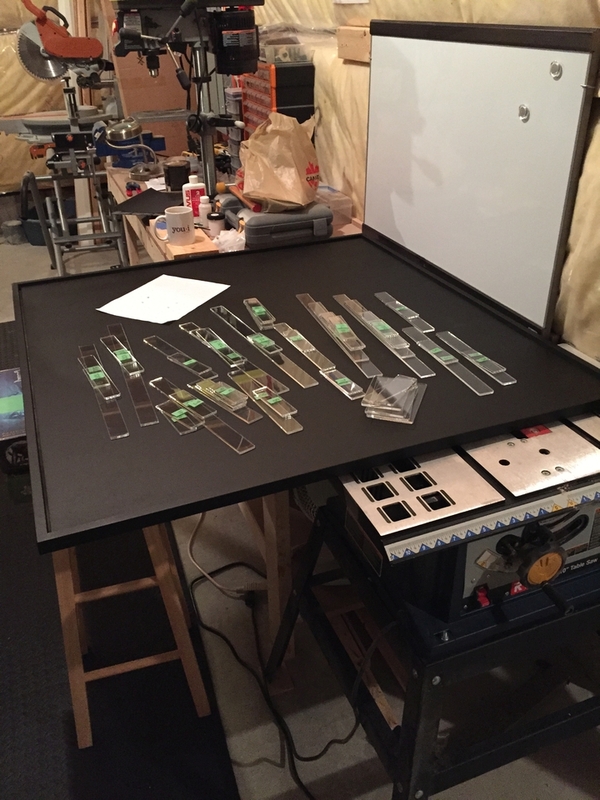 The RGB LED strips were installed in a gap between the main panel and the edging. I bought a 5-foot length from a seller in China for a reasonable price. You can find them for sale in North America but the price can be much higher. The strip must be powered and driven by a micro-controller, so a little time must be spent on what to do with the wires. 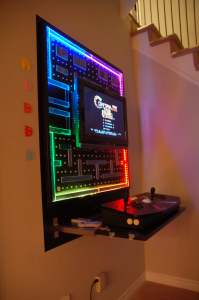 I have my arcade mounted on a wall that is finished on one side, so it was easy to hide a lot of the wiring for power, input devices, and video cables through the wall. If you were trying to install this on a wall that was finished on both sides, or which covered a foundation wall, then you may want to consider routing the cables through a hole and down the inside of the wall to another location. There are many multi-cade system’s in the market these days. I like the look of some of them and many are closed systems where expansion and experimentation are difficult. However, I have never enjoyed navigating through the various menus and settings from the arcade screen itself. I did not want to have a keyboard and mouse installed when I need to select a game, or to try and use a joystick to navigate around. As a side note, you can use the X-Arcade buttons and a trackball as a mouse, if you’re interested. Anyway, basically I wanted the system to be simple and intuitive without all of the difficulties around emulation and desktops. I wanted my father to be able to use this system without needing to know what a ROM image was or what sort of commands were needed to load a game or fire up an emulator. I also wanted other players to be able to look through the games and see what’s available while others were using the arcade. I tried other front ends that try to abstract the underlying emulators like Maximus Arcade, but I found that their application was unstable (at the time) and required tedious tuning of mapping the underlying emulator to it’s execution scheme. Once I knew I needed to write my own arcade front-end, I knew I wanted it to be a service that could accept commands from different clients running on different operating systems. The primary purpose of the server is to allow the user to play games, so it needed to run games made for hardware other than personal computers, such as the Super Nintendo Entertainment System (SNES), TurboGrafx 16 (TG-16), or an Arcade game. This requirement meant that the host platform (the machine and the OS running the server software) needed to emulate the other hardware, so it needed to be capable of running a game like Star Fox and the server software at the same time. The software emulating these other platforms are called, naturally, emulators and there are sometimes different program options available for the same system. The all have various technical limitations so some thought must be given as to which software you should use for your arcade. A database to hold and manage the information about the platforms, games, and the system. A server to drive the communication with the client, read content from the database, and to launch and control the emulation software. Scripts to wrap and control the life-cycle of the emulation software. These are executed by the service when a game has been selected on the client. I chose to use Qt as the primary windowing, communications, and UI SDK in case I wanted to move the server application to Mac OS X or Linux at some point in the future. I also consider the API to be one of the best cross-platform APIs around for desktop applications. As it turned out, I ended up implementing platform specific functionality as some of the third-party software required particular bits of functionality in order for them to work together with the system I was building. Provide the clients with a list of supported emulation platforms and games, including image content. Provide some safe guards around multiple clients accessing and attempting to control the arcade at the same time. Launch and terminate the emulation applications so that the arcade always returns to the same ready state when someone finishes playing a game. Communicate with other services so that decorative elements can be synchronized with the games and platforms being used. The client is an Android application, since I wanted it to work on the Ouya platform as well. The client presents the users with a simple connection method to the server (multiple servers are supported), platform selection, and game selection. I wanted to keep the client relatively simple so that game selection is fast and easy. As a minor feature, I wanted to the ability to take a screen shot of the currently running game, for high scores and other awesome feats, and then save it to the device so that it can be browsed and shared later. There is a decorative component to the arcade that gives it a bit of bling and acts as an attract mode. The LED strips mentioned earlier require a micro-controller to control them. I wrote a service that runs on a Raspberry Pi and it receives commands from the game server when various events happen, such as launching a game. The commands are simple and usually contain a payload like an RGB color. This allows the server to send different colors for each platform when a game is selected.